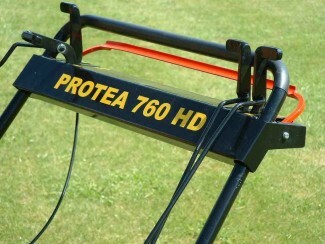 Amongst the most rugged and reliable cylinder mowers now available in the UK, Protea Heavy Duty “HD” mowers, in 24-inch, 30-inch and 36-inch widths, are suitable for a very wide range of fine turf applications from cricket squares through to outfields. 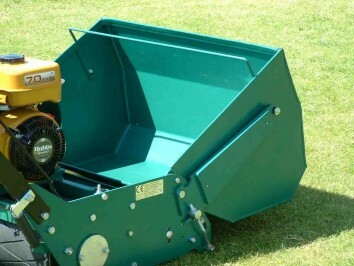 Standard features include an 8-blade precision ground cutting cylinder, dual rear rollers with removable roller scraper, tip-over steel grassbox, and the reliable and fuel efficient Subaru Robin EX17 6 hp and EX21 7 hp engines. 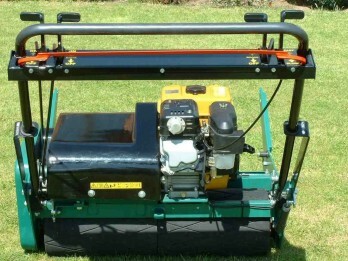 Every component has been proven in the harsh conditions of their South African home market, earning these rugged machines an enviable reputation for reliability. Industrial-quality bearings, heavy gauge steel chassis, heavy-duty transmission components and cable-free drive controls all contribute to a long service life. Simple, positive operator controls are combined with ideal weight and balance, making even the 36-inch version feel light and easy to operate. The open frame design of the “HD” models allows for easy cleaning and maintenance. 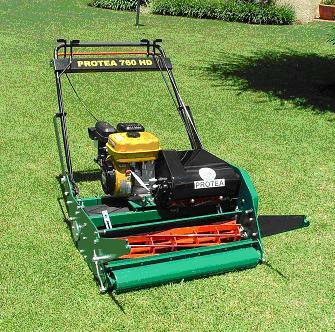 As with all Protea mowers, the “HD” comes with an adjustable rear roller assuring perfectly level cutting throughout the life of the machine. Precision cutting height adjusters enable very accurate setting down to 5mm with the standard bottom blade and even lower with a shaver blade. Extremely hard wearing rubberised rear rollers give additional grip on slopes and resist damage over hard surfaces. 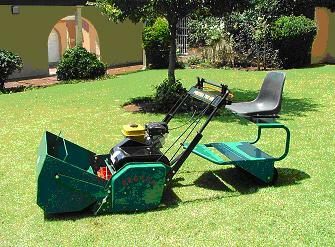 Much work has gone into producing a mower which, despite its large size, feels effortless and smooth to manoeuvre. Protea have engineered out excessive weight to reduce ground pressure and therefore soil compaction(see SPECIFICATIONS link at the bottom of this page for further information). 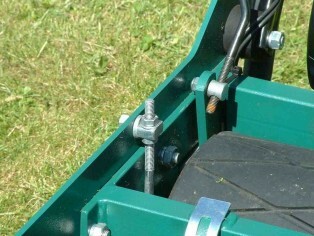 Controls are non-tiring to use and a height-adjustable rear roller guarantees a level cut is maintained throughout the life of the machine (so unlike all other mowers a ‘set’ can never develop). 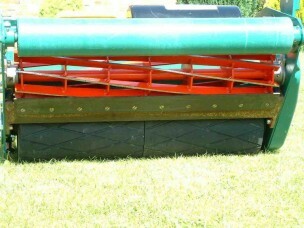 The highcapacity tip-over steel grassbox is convenient in use. 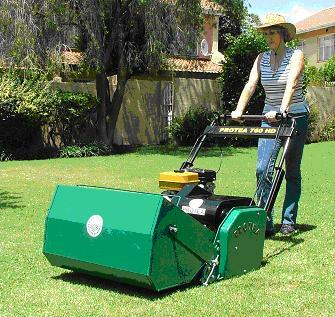 Availablei n 24-inch, 30-inch and 36-inch cutting widths, these industrial-quality machines can cut accurately down to 5mm and are suitable for a wide range of applications including cricket squares and outfields, parks, gardens and sports grounds. Designed to be easy to handle, simple to use and maintain, extremely rugged yet give a first class cutting performance, these mowers will reward domestic and professional users alike. Amongst the most robust cylinder mowers now available in the UK, all models feature powerful Subaru Robin overhead camshaft engines selected for their excellent reliability, long trouble-free life, high fuel efficiency and ultra-low exhaust emissions. Operator safety and comfort have been addressed by means of electrical safety interlocks and improved ergonomics, whilst vibration has been reduced to the lowest possible level without compromising feel and handling. The substantially built cutting cylinder can be reversed, presenting a new sharp edge to the bottom blade. This significantly extends cylinder life and reduces the number of costly regrinds. Customers can order any of the “HD” models to suit their exact requirements from a wide choice of options. 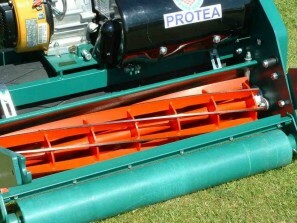 For example, a 12-blade cutting cylinder with shaver blade can be fitted for precision cutting of very fine turf where a heavy machine is preferred to roll as well as cut. A low-ratio sprocket set can be added to increase cutting pitch from 96 cuts/metre to 121 cuts/metre (and up to 181 cuts/metre with 12-blade cylinder). A highly effective and densely packed nylon brush strip can further enhance cut quality. A detachable sulky seat is available for those who require a ride-on facility and finally, a choice of reels can be fitted for grooming or brushing. Further information on reel action can be found in the 500SVGsection. Priced far below any comparable machine, every model in the “HD” range offers unbeatable value. Why not see what users think of our machines by having a look at our TESTIMONIALS? Engine petrol Subaru Robin single-cylinder air-cooled 4-stroke overhead camshaft. Clutches Separate independent clutches to cylinder and landroll drive. Drive systems Triple vee-belts plus triple heavy duty roller chains. Rear roller Height-adjustable rubberised two-part steel rear roller with differential, running in heavy duty ball bearings. Cutting reel 8-blade spiral, 152mm diameter, reversible. Bottom blade Hardened steel knife, 5mm thickness. Front roller One-piece steel roller. Have a question about this mower?